Must be off - got Windows updates to manage! 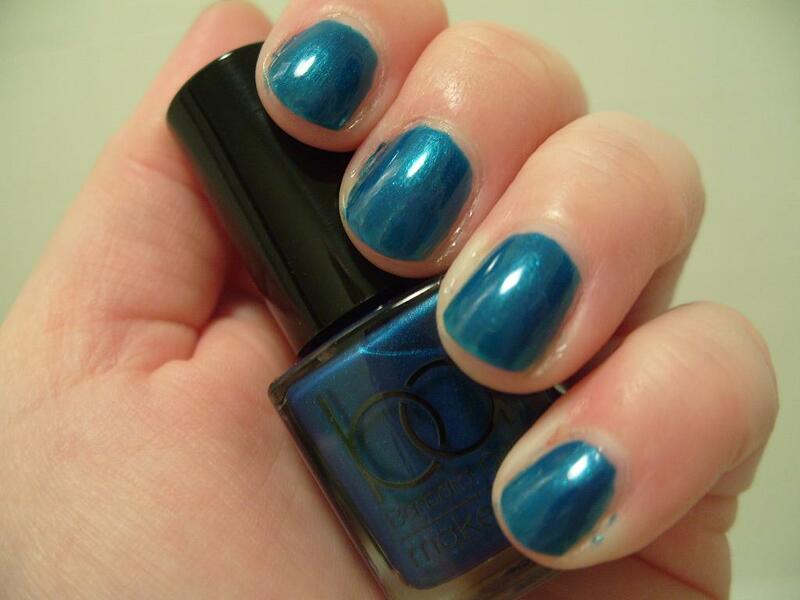 NOTD: Barbara Daly "Aqua Shimmer"
Just a short pass by today - busy busy! 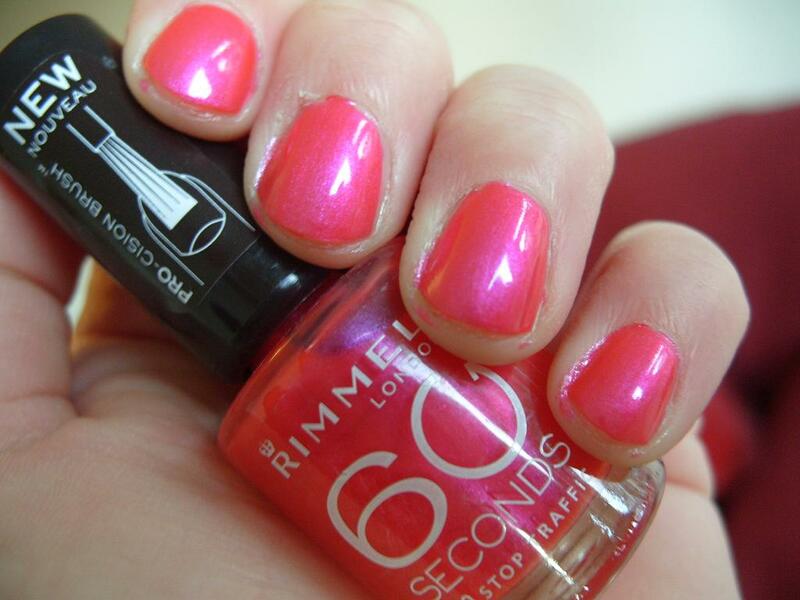 :) Picked this polish up at random in Tesco today! I should have put on another coat but I can't be bothered now. This is 2 coats with Megashine top coat, it looks washed out here but the deep aqua shimmer in this polish is lovely - my camera really struggle with this colour for some reason. Hope I can get some better photos tomorrow in sunlight. 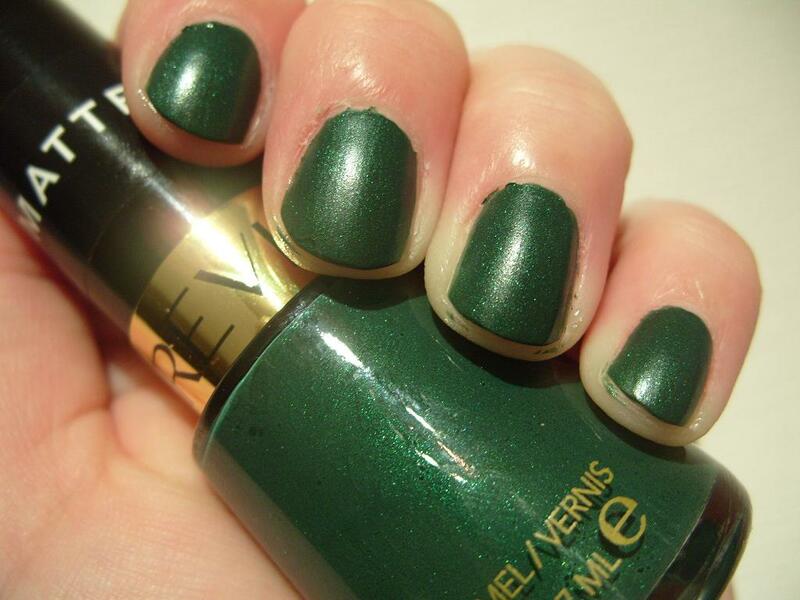 NOTD: Revlon Matte "Emerald City"
I saw this polish a couple of weeks ago and bagged it immediately. After swatching it on a nail when I got home, I decided however I didn't like it much. But as I sadly removed my glorious OPI Designer Series "Ruby" tonight, I knew whatever I put on would not be as glorious so I took this one out of my Helmer. Let me start by saying it is not a dupe for Zoya "Veruschka". 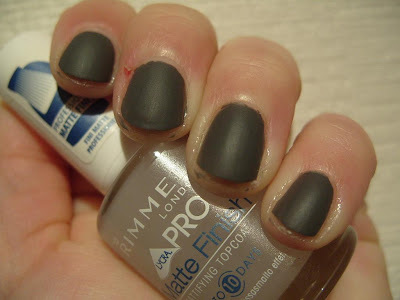 And it is not a true matte. I would say this is a dark green satin. These photos are taken when the polish is fully dry. None of my other mattes are this shiny. I contemplated putting my Rimmel or TopShop matte top coats but couldn't be bothered finding them. This is 2 coats over Nailgrowth Miracle. 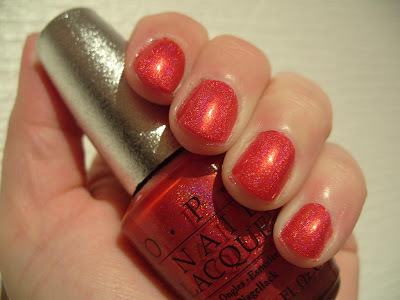 NOTD: OPI Designer Series "Ruby"
This is 2 coats of "Ruby" over Nail growth miracle and a slick of MegaShine. In low light it shimmers enticingly (as seen on the nail) and in direct light it glistens with a million little holographic prisms (as seen in the bottle)! I love the Designer Series polishes, but they are extremely expensive - £18.99 per bottle. A little steep but this polish is totally worth it!  I've got an old bottle of this fluoro pink shimmer and unlike the remade, new "Camoflage", this polish is pretty much exactly the same finish as the original! :) This polish has a strong blue flash that makes it pop. This is 3 coats with MegaShine top coat. Yummy and juicy! I am sooooo looking forward to the weekend however much building of IKEA furniture it will be. Now that our house is finally all finished, there will be much furniture building and unpacking :) Good thing I now have a happy manicure to keep me going! Wow! 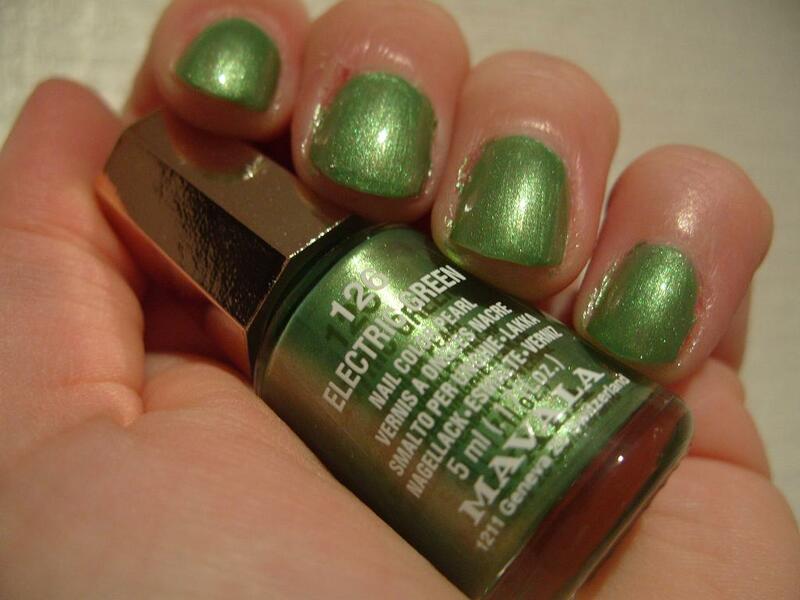 All I can say about my latest green love! This is from the s/s 2010 collection from Mavala called "Swinging Colours". This is 2 coats with a slick of Megashine - it needs it as the polish in itself isn't very shiny. But it glows green almost like "Moonpool"! :) Excellent for £3.95! NOTD: China Glaze "Wagon Trail"
Golden oldie here from China Glaze's autumn collection from a couple of years ago, I have actually never swatched this before!! 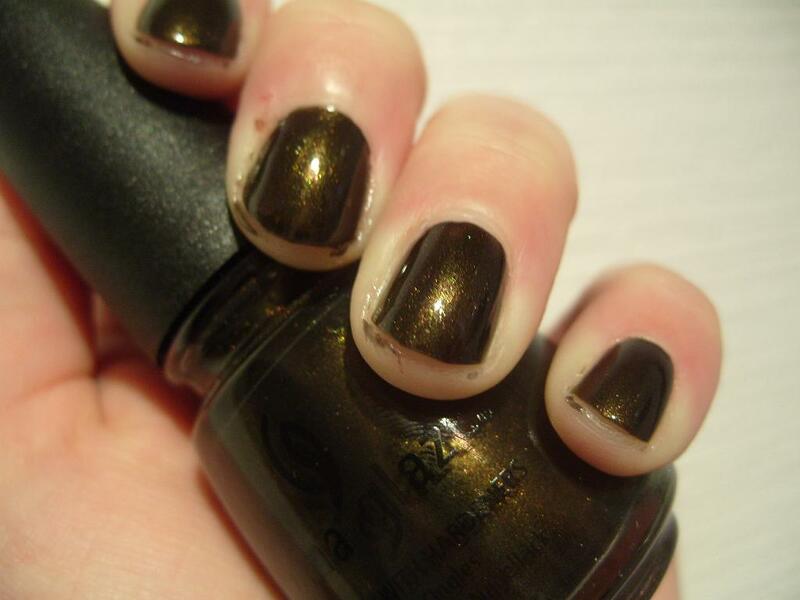 Some call this an olive shimmer, I am not sure what to call it. It's not golden brown, nor a bronze... What I can tell you is that I have no colour like it! My new nail combo if Nailgrowth Miracle and Nail Shine Miracle isn't as good as my Miracle Cure and MegaShine top coat, it takes a lot longer to dry. I am not so sure Nail Shine Miracle is shinier than MegaShine or lasts longer. Oh well! I've still not found other bottles so guess I just have to sit here and wait for it to dry! I've caught some kind of bug and under the weather, however here is a quick NOTD for you, Barry M "Grey" with and without Rimmel's new Mattifying Topcoat! This is 2 coats of Barry M and a slick of matte topcoat. It has worn well but I've not been doing much so I suppose that's the reason it's looking good! Please excuse the extreme nature of my cuticles, life has been rough to my hands lately.. Which one do you prefer, the glossy or the matte? I love both, for being a different finish to the same polish. As I've misplaced my usual Sally Hansen base and top coats in the move somewhere, I got replacement ones with my Boots Reward points today - Sally Hansen "Nailgrowth Miracle" treatment polish/base coat and Sally Hansen "Nail Shine Miracle". So far so good however I don't think "Nail Shine Miracle" top coat is as quick drying as MegaShine but it's not bad - I would say a good 5 mins is required for dent-proofing. These new Sally Hansens are very pricey - just about a quid shy of OPI Nail Envy and Seche Vite top coat at £9.45. That's a little more that I would normally pay for a so called drugstore brand. I will let you know the wear test results! 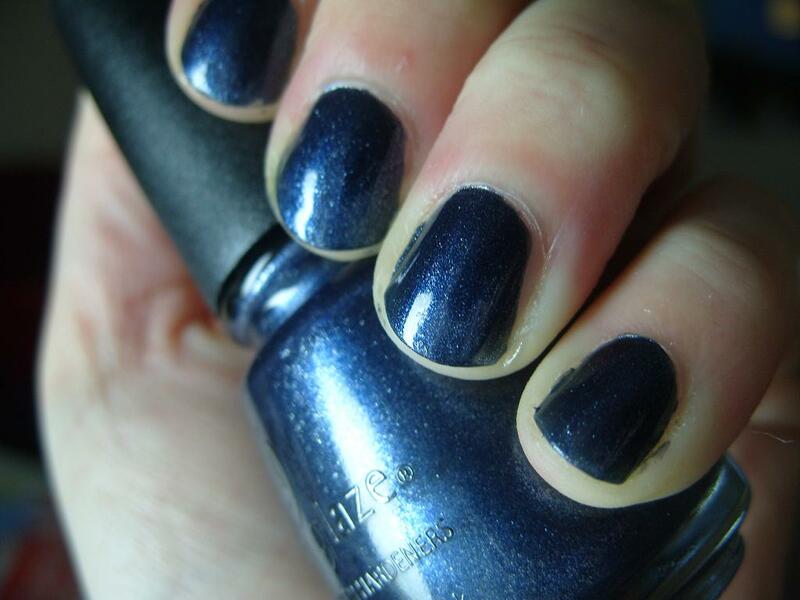 NOTD: China Glaze "Midnight Mission"